Annabelle: Creation - Blu-ray Review - ReDVDit! Annabelle: Creation is a 2017 American supernatural horror film that was directed by David F. Sandberg and was written by Gary Dauberman. 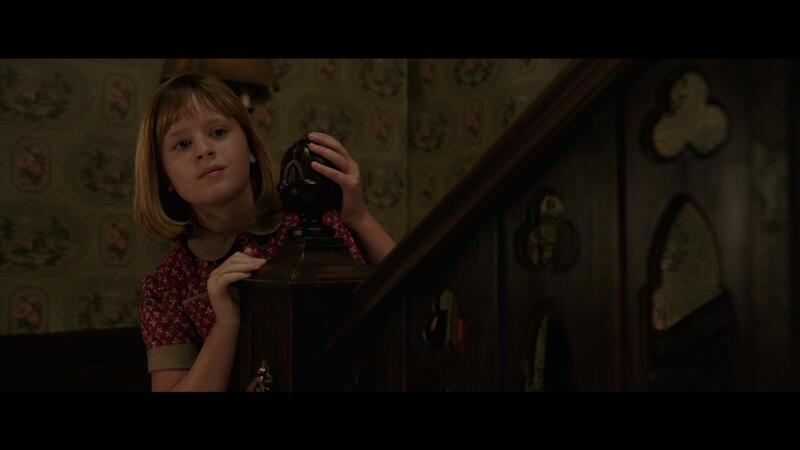 It serves as a direct prequel to the 2014 film Annabelle and the fourth installment in The Conjuring film series. 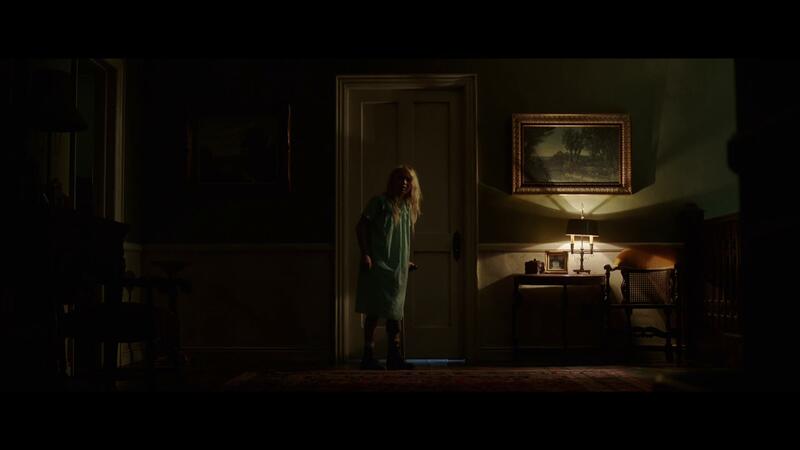 It features stars like Stephanie Sigman, Talitha Bateman, Anthony LaPaglia, and Miranda Otto, and depicts the possessed Annabelle doll’s origin. Making its US premier at the LA Film Festival on June 19, 2017, it was theatrically released on August 11, 2017. It was initially set to be released on May 19, 2017; but, was pushed back to avoid competition with Alien: Covenant. Releasing alongside The Nut Job 2: Nutty By Nature and The Glass Castle, it was projected to gross around $30 million from the 3,502 theaters playing it during opening weekend. It went on to open to $35 million, and was the lowest of the series, but still topped the box office charts. In its second weekend, it dropped 55.7% to earn another $15.5 million, which was a smaller second-weekend drop than Annabelle (57%) and The Conjuring 2 (63%), and the best second-weekend hold of the franchise since the initial Conjuring film (46%). Overall, it ended up grossing $303 million worldwide and generally received positive reviews from film critics who praised the films atmosphere and acting, and noted that it is an improvement over its predecessor. 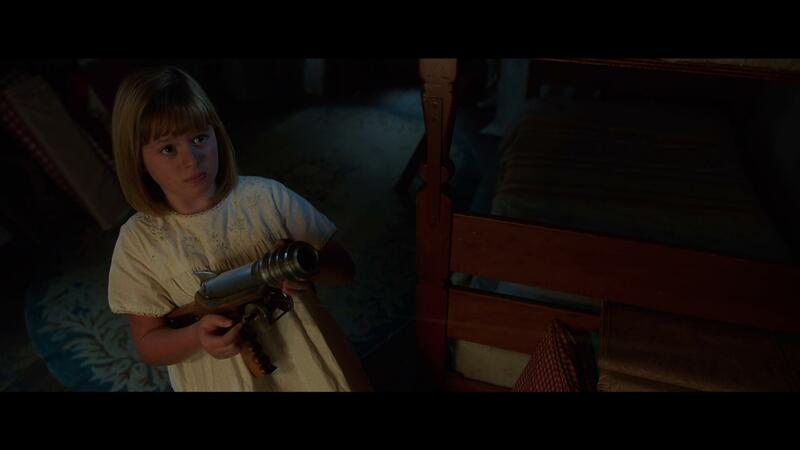 This film, Annabelle: Creation is exactly what the first film should have been. Offering a much better story line, with significantly better scares than its predecessor, this film offers an experience that really should have been used to introduce itself into the world. Offering not only the origin of the Annabelle doll, but a significantly better range of scares or haunts that helped to make for a much better experience. The story line is solid and holds up really well throughout the film, and I have no complaints at all about this movie. Annabelle: Creation in 1080p looked really nice as it played out across my living room television. Offering some beautiful scenery during the initial half of the film, my wife and I were able to really appreciate the sense of remoteness of where the Mullins family lives. I did have a little bit of an issue in the more lower lit scenes with visually seeing everything due to a lack of ambient lighting, but this may have been a personal thing with my eyes as my wife was able to see everything without issue. Overall, the picture was clean and clear, and we were able to see pretty much everything as the story progressed. 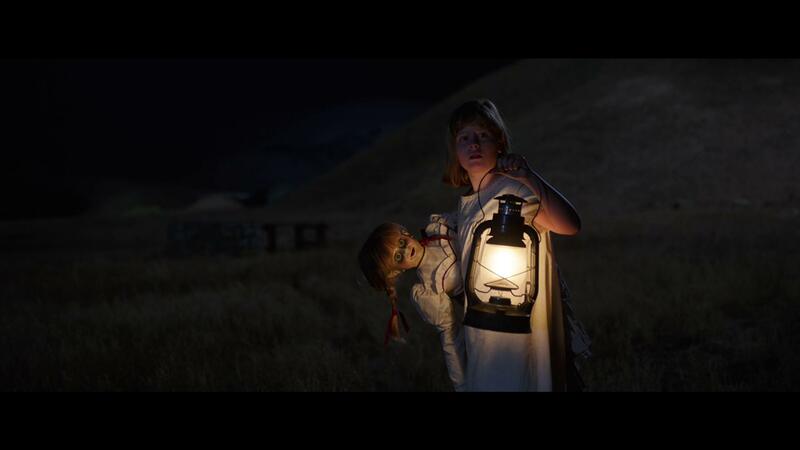 Packaged with a Dolby Atmos audio track, Annabelle: Creation offers an all out immersive experience for those at home that are able to make use of the included elevation channels. Unfortunately, this film doesn’t really have a need for its inclusion and I feel that this movie would’ve definitely fared better with a DTS:X audio track as it would’ve offered a significantly more impactful experience. That said, the overall quality of the sound was really clean and clear, offering a bass track did a really nice job at emphasizing the scares that were about to happen. Another notable portion of the audio was the films use of the rear and surround speakers. Making sure to place the audience right in the middle of the household as all of the scarier stuff was about to go down. 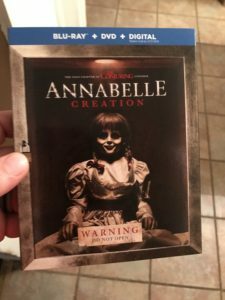 Annabelle: Creation comes packaged in your standard two-disc Blu-ray amaray case. Within that case is the standard Blu-ray copy of the film as well as the standard DVD copy of the film. Unfortunately, neither the included Blu-ray disc nor DVD disc feature any artwork whatsoever. Each disc only bear the standard text for the respective release with a generic black background. 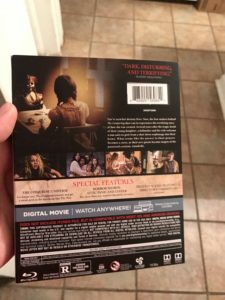 A digital copy redemption pamphlet has been included for on the go streaming, and a slipcover has been made available during the initial run of this release. Generally speaking, I thoroughly enjoyed Annabelle: Creation and the experience that it provided. The story was really well done and offered a lot of insight into the origin of the doll at hand. While it not only provides that, there’s definitely a better range of scares that are used in this film that after watching through this, I can honestly tell you that this should’ve been the film that elaborates on the character in The Conjuring universe. The overall visual presentation was really nicely done despite my personal issues with sight, and the audible experience was nice; but really could’ve been better with the inclusion of a DTS:X audio track. There are a few additional features that are included, but it’s been very minimal in what shows the work that went into filming. Overall, if you’ve been on the fence about picking this movie up, I’d definitely recommend grabbing it if you’re following The Conjuring universe because it is a solid addition and definitely should not be missed.